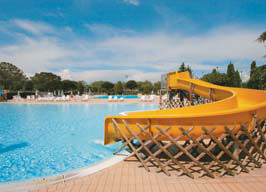 A large and lively parc with a scenic location but also close proximity to Peschiera itself. 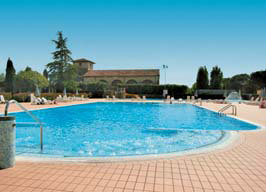 Surrounded by parkland but just a stones throw away from Peschiera town centre lies Del Garda. 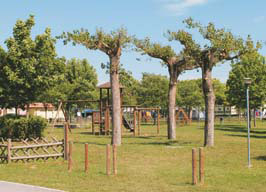 Surrounded by parkland but just a stones throw away from Peschiera town centre lies Del Garda. With four pools, including children's pools and a busy animation programme with organised watersports on the beach and a children's playground, it's also ideal for those who like to stay busy on holiday. There's plenty of shade available around the pool area, as well as sunbathing space and you can enjoy tennis, volleyball, aerobics, aqua-aerobics and lake fishing here. A bar, restaurant and supermarket are available to cater for most needs, but should you wish to get out and about, Del Garda is within very easy reach of the many local attractions including the �Gardaland Theme Park' and �Caneva World Waterpark'. 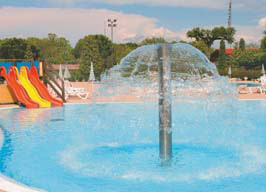 Camping Del Garda offers the following facilities. Excursions to Venice, Verona (Opera) and many more. More details are announced over the site's loudspeaker. Take the Peschiera exit from the A4 motorway. Following the line of traffic you will come to a T-junction, here you need to turn left in the direction of Verona and Peschiera. Immediately the road forks, bear right following the river and after approximately one mile you will come to a roundabout. Turn left here for Peschiera Centro (last exit). Immediately take the first right turn following signs for Del Garda. Continue straight along this road and Del Garda is at the end on your left. Gardaland is the largest amusement park in Italy, and one of the largest in Europe, it offers its visitors no less than 11 different shows each day and 5 themed restaurants. The Park has rides for the courageous such as Blue Tornado, Space Vertigo and Magic Mountain or you could discover the ruins of an ancient oriental temple on board a rubber dinghy, or there is Fantasy Kingdom for the children. Parco Natura Viva is a park split into two, Faunistic park and Safari park. The Faunistic Park features wild animals from European forests and other forestry animals of the world including wolves, wild boar, and pumas. The Safari park includes the big wild animals of Africa such as the lion, leopard and elephants. There is also a Botanic Garden to explore along with a Dinosaur park. The museum was inaugurated in 1990. It displays the remains of a peat body found near Desenzano. In addition to ceramics, flint arrowheads, weapons and utensils, there is a large oak plough from around 2000 BC. 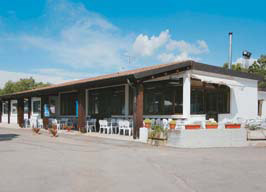 Have you been to Camping Del Garda? Please submit your review so that others can benefit from your experience. Important note: Information provided here about Camping Del Garda is based on our best knowledge. However, please check with Camping Del Garda before booking to ensure that you have the information required. Reviews are the sole views of the contributor and do not necessarily represent the views of bookselfcateringholidays.com or Camping Del Garda.